A Short Butterfly Spread or reverse butterfly is the inverse of the more conventional Long butterfly. Short Butterflies are non-directional strategies that can be created from either puts or calls. As with Long butterfly Spreads, the wings are equidistant from the two Options which make up the body (although the are Long rather than Short positions). Short Butterfly Spreads are a limited profit and risk defined strategy. 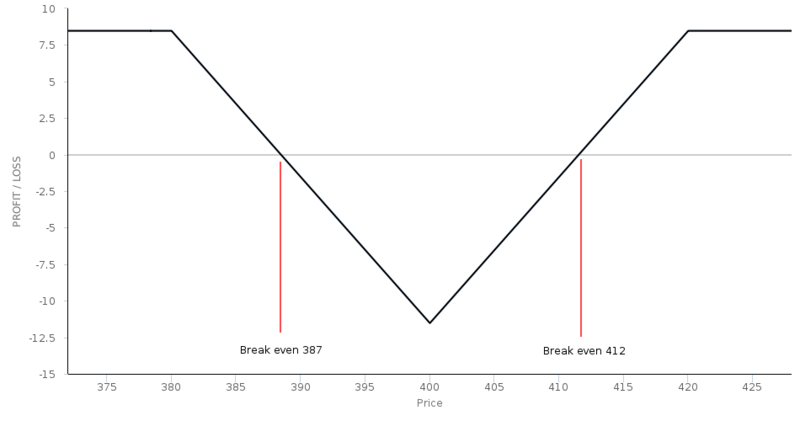 Maximum loss from a Short butterfly position occurs if the price of the Underlying is at the same price as the two Long Strike Price contracts. Maximum profit is possible if the price is outside of either of the two Short wings. Theta (time decay) is negative for Short butterflies because the opportunity for them to become profitable is reduced. Short butterfly strategies benefit from Volatility, but unlike alternatives such as a Long Straddle or Strangle, the benefit is less pronounced. The Short Iron Condor is similar in terms of risk and potential profit characteristics. Video from FinIdeas explaining the behaviour and characteristics of Short Butterflies. OIC Article on short butterfly strategies.